new gif looks good, are they static or pre-populated from the /GET-FEATURES command ? 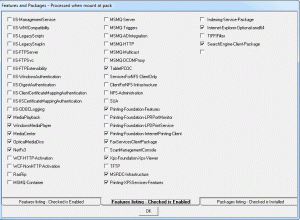 How about the Packages, are you using Install_WIM_Tweak.exe or something else to enable the rest of them ? So will a person like me, with zero knowledge about xml and all the manual setting/scripts, be able to use this utility in same way as vLite? Without having to configure it somehow. Not static. Hadn't gotten that far yet just loading them from the /GET-FEATURES > txt file 110 in features = 2 pages, as we know MS will come out with a SP and probably be new stuff. Yes should be able to use this easily. Click the labels next to  boxes and has a short summary on a lot of them. The help file is close, hadn't updated since Vista but Seven and Vista are close, just Seven is lot better. Start with Sample.xml and you can go from there, i give the basics to get you to partition selection, select and it will auto run. I just don't want to lose my backup drive and I dual boot so want to choose carefully there. On a side note, can you give me rough directions where to look if I wanted to educate myself in this particular field? I might be interested in a little more than selecting components to remove. Did you install to a root folder like C:\Se7en_UA? I'm lazy and this won't work from Program files or any long path with spaces. What is your OS and x86/64? Copy the Dvd sources, Extracted as above. First time have used your app for seven. Doesn't appear that I can skip any steps after mounting an image, eg must first select an addon then drivers, then apps etc. Is it @ all possible to select say only addons, drivers & hotfixes only for instance? I can see this is a good app, but cannot get past the addon or driver integration step, finding the app wants to unmount & commit the image by itself. Also is it normal to have to restart the app @ each stage? you do have a folder called APPS on the root of any drive Windows will see it? Sorry Max I'm obviously not clear with my Q's, I haven't got the APPS dir in the root though is it possible not to include installing apps, addons etc? OK Max thanks working with it now.